My nickname for the past seventeenish years has been Psy, and I love bikes! That's where the name velopsy came from one late night when I decided that maybe I should write about these amazing machines that I love so much. 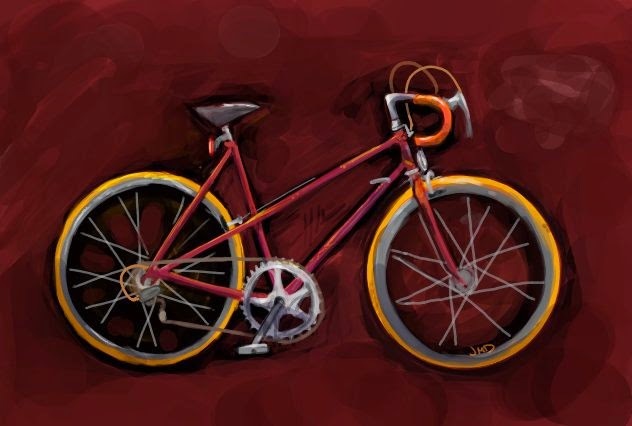 I started riding as a student when I was nineteen, on a Nishiki Custom Sport mixte that was about a foot too small for me and weighed about eighty pounds (thanks, hi-ten!). I doodled this one day. I loved this little mixte! I fell in love with cycling, and slowly started learning how to maintain my bike, since I couldn't afford trips to the bike shop to get it fixed. Lots of internet research led to me learning how to fix and build, but it also got me interested in framebuilding. One day I found the Yamaguchi Frame Building School and vowed to attend it one day. It took me five years, but I did! Sometime around the end of 2010, I started daydreaming about building frames under the name "Petrichor Frames," but I figured it was probably impossible. Still, I kept it in my head. Digging through the depths of the internet led to me discovering the strangest and most beautiful bike I had ever seen: the Takhion. At the time, I didn't understand fixed gears, but I was so enamored with these bikes that I swore I would learn, and my search to find one began. After many years, I found one! And then it broke, and I was crushed. This led to a post on this blog that led to me meeting some utterly fantastic people. You all know who you are. It's been a few years, different places around California, lots of learning, dreaming, building and riding, but as of now I build frames, have a few Takhions that I am constantly searching for parts for, help people find information on their bikes, and sometimes make 3D parts. Though this is not what I do full time, I pour my heart and soul into these incredible bicycles and everything that has to do with them. If there's anything I can do for you, whether it's answering questions, finding parts, or doing a custom 3D part, please e-mail me! I'm always willing to answer questions, or learn something new if you notice an error on this blog, or just talk bikes. I love talking bikes. And please feel free to use any photos here that I have taken, just link back to me if you do.